Penn again played only 1 game, an away loss to Princeton 21-8. 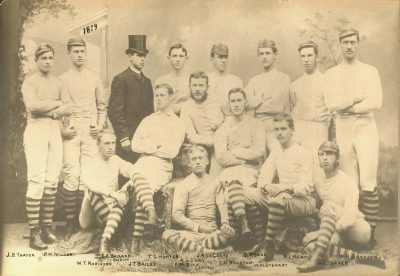 The 1879 yearbook and the 1913 Athletic Association history of Penn athletics lists seven College students plus two Medical School students as players on this team, as well as a manager. A photograph of an 1879 baseball team, however, identifies an amost completely different group of players.